This book has been reviewed again. Click here to read the new review! 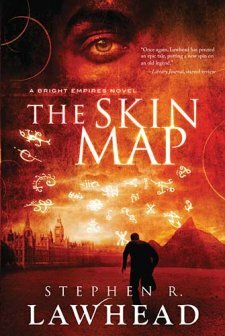 The Skin Map by Stephen R. Lawhead is an interesting book, to be sure. It uses the idea of ley lines. They’re portals, of a sort, that cross different layers of the universe. Kit Livingstone is introduced to this concept of traveling between different timelines in history by his great-grandfather. Kit shows his girlfriend, Wilhelmina, what he has found, but she ends up in a different time and place than Kit. Along with Cosimo (his great-grandfather), he sets out to find the Skin Map in order to figure out where Mina is and bring her home. The Skin Map is literally that –a map, tattooed on the torso of the map who traveled the ley lines before Cosimo, which was preserved after his death. Meanwhile, Wilhelmina is adjusting quite nicely to Prague. The story itself was good, though at first it seemed almost like Back to The Future meets National Treasure. However, it’s the concept of ley lines that I was wary of. Kit mentions New Agers when Cosimo first begins explaining the ley lines, and that’s also who Stephen Lawhead says he saw looking for ley lines in 1985 at Stonehenge. While in a work of fiction I wouldn’t think twice about time travel or portals, the knowledge that ley lines were mentioned as a New Age theory makes me wonder. The Skin Map, while not an absolute favorite, had some good qualities. After the first few chapters, I was unsure if I should continue reading, being new to the concept of ley lines, but the book itself turned out just fine. However, it should be remembered that this is a fictional story. I do not personally agree that there is a possibility of ley travel. I received this book for free from the publisher in exchange for its review. I was not required to give a positive review. Good review. I’ve not read anything by Lawhead, but I am an avid fan of science fiction, and this one looks interesting. I’ve heard Lawhead’s Robin Hood series is worth reading, too.